It’s difficult to overstate the lethality and addictiveness of crack cocaine. It is one of the most potent and dangerous forms of the drug and is responsible for thousands of deaths each year in the United States and around the world. The National Institute on Drug Abuse reports that approximately four percent of Americans ages 26 and older have used crack at least once, including nearly two percent of high school seniors. While these rates are relatively low compared to powder cocaine and other drugs, they still represent a significant public health issue. The politics of crack addiction have caused a narrative to develop that the drug is one that affects primarily minority communities–the reality is that crack addiction impacts every type of American. In fact, data from the Criminal Justice Policy Foundation indicates that 55 percent of crack users are white. No matter your race, age or cultural background, crack addiction destroys your health and quality of life in the same way. If you or a loved one have fallen victim to crack addiction, the clock is ticking. Get the help you need today to break this destructive cycle. Crack cocaine is a freebase form of cocaine that is synthesized into crystalline rocks that can be smoked. The direct and immediate method with which it is administered makes it a preferred method for those looking for a more potent and faster-acting high. Effects of crack cocaine manifest immediately because it reaches the bloodstream and brain more quickly (often in as little as eight seconds)–however, the effects of smoking cocaine are shorter in duration, lasting only five to 10 minutes versus 15 to 30 minutes for the powder variety. It is impossible to recreate the first-time effects of crack cocaine–however, users try desperately to do so. This leads to tolerance and subsequent addiction. Crack cocaine abuse can also increase the risk of depression and other serious long-term mental health issues. In a cruel irony, some crack users actually try to use the drug to medicate for these issues and get caught in a cycle of relapse and exacerbation of symptoms. Crack users are significantly more likely to overdose than powder-cocaine users. These symptoms and others can manifest anywhere from an hour to a few days after the last cycle of crack use and last for more months. This is why it’s critically important that users get help from their physicians during the protracted duration of the withdrawal process. Trying to detox from crack alone often leads to relapse. These symptoms and behaviors are likely to get worse as the prolonged and untreated crack abuse persists. 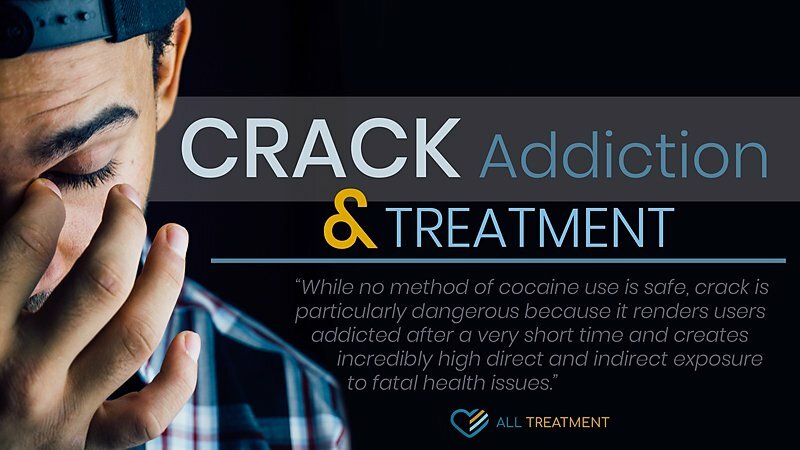 The treatment of crack cocaine addiction is a complex and delicate medical procedure that requires expert doctors, nurses, and mental health professionals. The first step in the process is a thorough course of medically supervised detox to stabilize patients, help them through their acute withdrawal periods, and make sure they’re getting care for any associated medical condition. Once patients are medically stabilized, withdrawal symptoms can still last for months and will require ongoing management from patients’ primary care physicians or treatment providers After detox, patients will usually require in-depth and targeted behavioral rehab to address the mental health issues that caused and resulted from their prolonged crack abuse. Crack cocaine addiction yields a variety of long-term psychological issues and it’s important that patients get the behavioral health treatment they need to move forward in their recovery. Rehab should include group therapy, individualized counseling, and other appropriate supplemental techniques. Once the formal treatment process is complete, patients should receive a customized and realistic aftercare plan to help them avoid relapse and gradually repair the lifestyle fallout from addiction. These plans should include contact information for addiction-trained therapists in the patients’ local communities. The road back from crack cocaine addiction may be difficult, but it’s not impossible. If you or your loved one are one of the millions that have fallen victim to crack addiction, get the quality help you need and deserve. There are more resources than ever to help you bounce back from this devastating illness. You don’t have to sacrifice your life to crack addiction. Trust your family and your treatment center to help you attain peace of mind and lasting wellness. A better future is closer than you think.